This photo narrates an touching incident that took place coinciding with the utsavam at Sri Varadaraja Perumal temple at Kanchipuram. It is an established practice that Sri Varadaraja Perumal visits Srimatam during the utsavams. 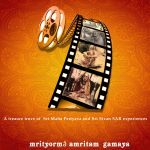 Anticipating this visit, Mahaperiyava with great enthusiasm came and sat at the entrance of Srimatam right in the early morning itself although there were many more hours to go before Perumal would arrive near Srimatam premises. And He would not have His Bhiksha until He had the darshan of Perumal. 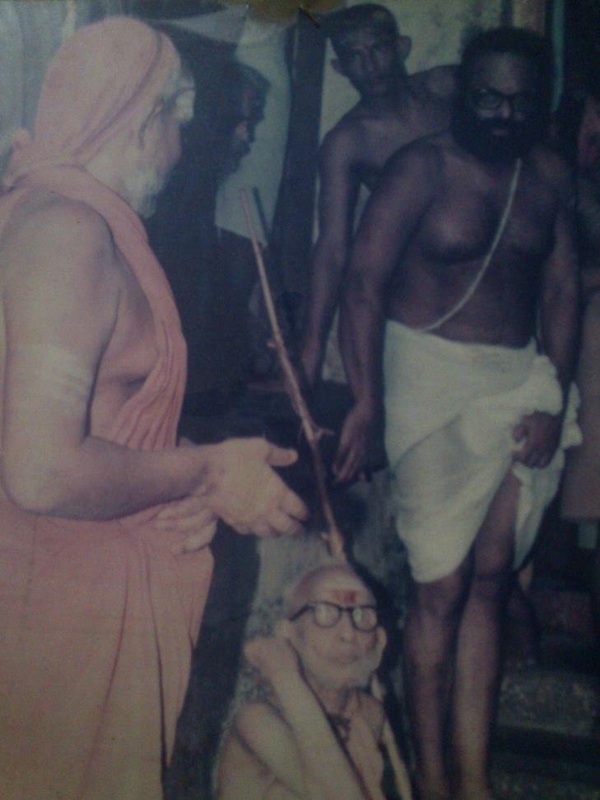 In spite of all the kainkaryaparas requesting Mahaperiyava to come back inside since there was a long time to go until Perumal arrived, He would not budge. They had no other option other than request Sri Pudu Periyava to speak and convince Mahaperiyava to come inside the Srimatam, and this is the sight where Pudu Periyava is trying to convince Mahaperiyava to return back inside and come back later when Perumal arrives at the premises. Periyava’s level of bhakthi and childlike enthusiasm is amazing. Here Sri Maha Periyava had become more or less like a child. How great ‘mano bavam”. Hara Hara Sankara Jaya Jaya Sankara! Indeed a very rare photo. No words to express this amazing act of Mahaperiava in seeking darshan of PERUMAL. This photo is amazing. It is a bhaghyam to see Maha Periyava’s innocent face that this photo has captured. The mano-bhavam is unimaginable. Periyava Saranam. Harahara Sankara jayajaya Sankara. Maha Periyava photo is very rare as stated. It reveals his great enthusiasm & devotion to have The Dharsan of the Perumal. Yes of course Our MahaPeriyava ( Lord Parameswara) has come out to have darshan and receive Lord Varadha Raja ( Lord Maha Vishnu) to BooLokha Kailasam ( Sri Kanchi Mutt ) Hara Hara Sankara Jaya Jaya Sankara. This should have been during the 4th Day of the Brahmotsavam which apparently is his birthday. Devaperumal blesses in his seshavahanam. Good post. Thanks.